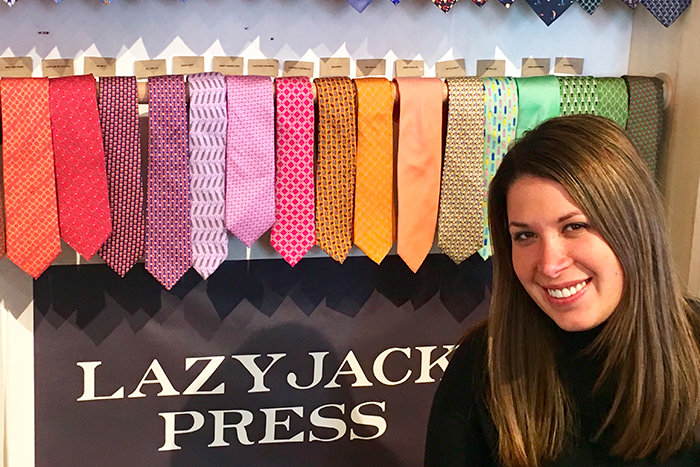 Not everyone decides to launch a business while studying for the bar exam, but co-founder and CEO of Lazyjack Press Miriam Zelinsky ’06 (French, history) managed to do just that—and succeeded in grand fashion. How did Dickinson prepare you for your current career/endeavor? From my first visit, I knew Dickinson was the college for me. It wasn't only the strong academics that drew me from San Francisco all the way to Carlisle, Pa., it was what Dickinson stood for. I learned so much in the classroom from amazing professors who continuously challenged me as well as invaluable lessons outside of the classroom. I learned the true value of friendship, from the sisterhood of my sorority Kappa Kappa Gamma to the discipline of being on the tennis team, the independence and exhilaration from studying abroad and just those relaxing moments when I'd sit with my roommate in the red Adirondack chairs by Old West chatting about our day. I lost a parent during my junior year, and the way the Dickinson community came together and supported me made me know I had a second family within the limestone walls and now, beyond. Dickinson never stopped challenging me and pushing me to be the best person I could be. My experience prepared me for a grueling legal analyst position in New York City following graduation, and then a successful three years in law school. Dickinson gave me the strength, confidence and ability to be able to go out and launch my brand. What was your "aha" moment? I had been noticing for some time that there was a gap in the market for well-made ties for the young professional. Hermès and Ferragamo are wonderful, but few college students or graduates can afford to have a closet full of those ties. There wasn't a good quality tie between the usual preppy brands and the well-established European luxury brands, so I found that niche in the market to create something better. It was after my five-year Dickinson reunion—seeing my friends and reminiscing at the Gingerbread Man about old times—that I came up with the idea for my first tie. I luckily scored a meeting with Barney’s to present my idea and told them that I'd be making my ties on Hermès silk in Italy. I had just graduated from law school and was studying for the bar exam and couldn't have been more shocked when they told me to come back in three months with the rest of the line. And so, Lazyjack Press was born. My first ties were Kegs & Eggs, Beer Goggles, Sweet Shades, Do You Even Lift—just to name a few that are irreverent and fun, yet representative of the American college experience. As the brand has grown to include more subtle and work appropriate styles, each tie’s cheeky name, as well as its excellent quality, is what sets it apart from the competitors. My dad was an entrepreneur. When he was six years old, he won several quarts of motor oil in a game of bingo. He traded the motor oil for an antique penny slot machine. As he got people to play the machine, he would save the coins to buy his next machine. He eventually started the Musée Mechanique, which is the largest collection of antique coin operated machines in the world. It still lives on after him, and I think his spirit and his drive is in my blood—to create something new and have it be the best possible thing it can be so that you're proud to put your name on it. I constantly want to be challenged, to learn and create new things. What advice would you offer to the entrepreneurs of tomorrow? Be patient and believe in your ultimate goal. There will be days when you'll want to give up and think you're a failure, but things will turn around. You just have to continue doing your best and eventually, it will pay off. I'm always thinking of new tie, bow tie and pocket square ideas. I just launched my sock line this winter, and little boys' bow ties in March. I also have a pop-up shop in Grand Central Station from May through July. I'm trying to do more markets, holiday pop-ups and international trade shows to meet people, because there's no greater satisfaction than seeing people smile or laugh as I tell them what each tie is called. It's really rewarding. I just got into nine stores after two trade shows and am always looking to expand my wholesale accounts. I also love doing custom and have had the privilege of doing custom work for some Dickinson alums' weddings. "Entrepreneurs don't just grow on trees"